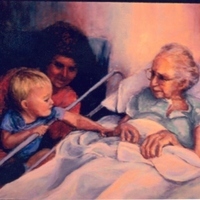 A painting by Bettye Reagan, a local artist in Central Florida, inspired by a photograph of Mary Alice Powell Aulin (1904-1993) at the Winter Park Hospital in Winter Park, Florida, as she is being visited by her daughter, Bettye Jean Aulin Reagan (1923-), and her grandson, James Phelps Richardson. Alice Aulin was born in Sanford, Florida, to parents Charles Powell and Mary Maude Rabun Powell. Aulin arrived in Oviedo in 1921 to work as a switchboard operator and a seamstress. She married Andrew Aulin, Jr. (1893-1964), the son of Oviedo's first postmaster, Andrew Aulin, Sr. (1843-1918). Together, the couple had five children: Mary Lenora Aulin (b. 1924), Alice Kathryn Aulin (b. 1926), Charles Warren Aulin (1927-1964), Bettye Jean Aulin, and Andrew Aulin, Jr. (b. 1936). Original painting: Reagan, Bettye. Need No Title. 1994: Private Collection of Bettye Reagan. 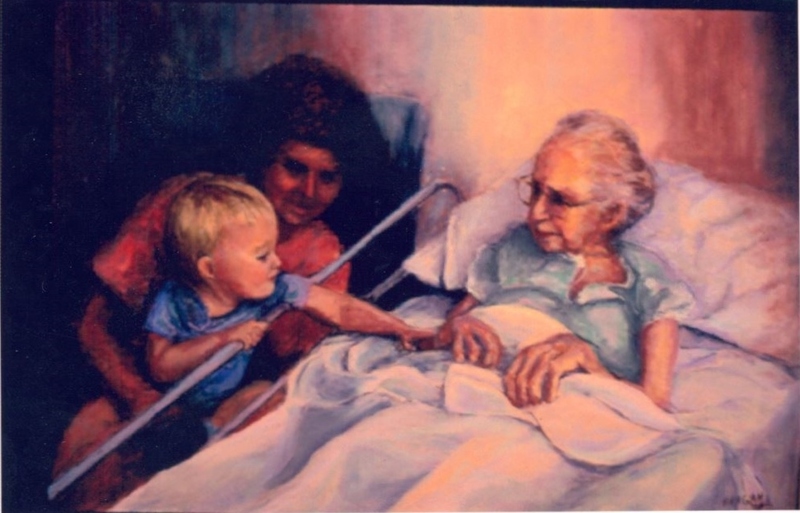 Digital reproduction of original painting: Reagan, Bettye. Need No Title. 1994. "Bettye Jean Aulin Reagan and James Phelps Richardson Visiting Mary Alice Powell Aulin at the Winter Park Hospital." RICHES of Central Florida. https://richesmi.cah.ucf.edu/omeka2/items/show/6954. Reagan, Bettye Jean Aulin. “Need No Title by Bettye Reagan.” RICHES of Central Florida accessed April 22, 2019, https://richesmi.cah.ucf.edu/omeka/items/show/6955.